Orders received by 12:30 p.m. Pacific Time Zone can be delivered that same day. We also offer "express deliveries". Please call 800-875-9193 and one of our staff will assist you if you need a timed or express delivery.We deliver twice daily, six days a week to: Portland, Lake Oswego, Beaverton, Hillsboro, Aloha, Tigard, West Linn, Tualatin, Wilsonville, Oregon City, Milwaukie, Clackamas, Gresham as well as Vancouver, Washington. Zip codes, major hospitals and funeral homes that we deliver to are listed below. A delivery fee will be added to the Total order. Gifford's Flowers can also send flowers throughout the United States or World Wide through FTD. Please note: Certain arrangements and flowers may not be available outside of the Portland Metro area. We do work hard to try and find the perfect florist to fill your order. Call 1800-875-9193 if you have any questions concerning availability or pricing. 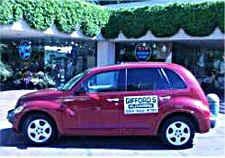 Gifford’s is open Mon-Fri 7:00-5:00 and Sat 9:00-3:00. We are Closed on Sundays and all Major Holidays. Gifford’s makes ordering flowers on-line easy. For that last minute need, special request, custom design, or if you just prefer that human touch, call us.